This seems to be working for my elderly kitty who does not like to get her feet dirty. So far no accidents since we got the kitty potty. I sure hope this is our solution to a very annoying problem. Keep your house free from cat litter odor with this litter that comes with a carbon odor-absorbing filter. The cat litter features a tray with a liner so your cat's waste disposal is sanitary. This potty promotes your cat's natural waste elimination habits, and the plastic construction makes it easy to clean. THE BEST LITTER BOX I EVER BOUGHT !!!! 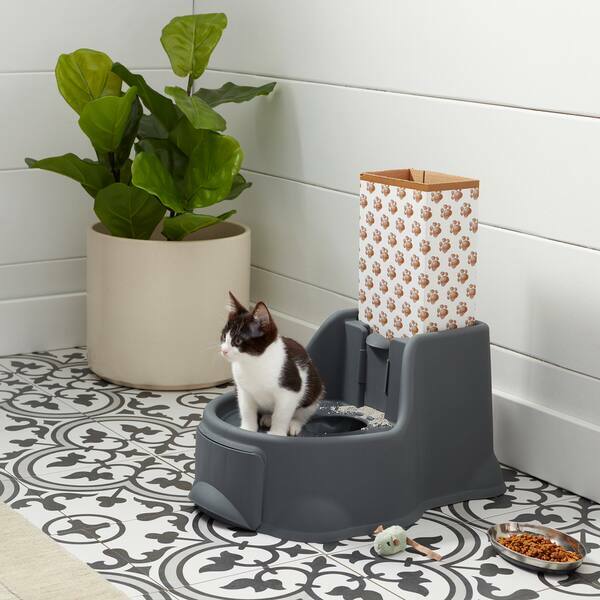 my 3 cats love the Kitty Potty I have 2 of these &amp; I bought 1 for my sister she says her cat loves it , the Genie is to expensive &amp; the other litter boxes smell , this is a no touch litter box beautifully designed, I highly recommended this one out of ALL OF THEM !!!! This makes litter box changing a breeze . My cat left after I put this up for him to use. He may have used it a few times. It is partly made of cardboard and the opening is very very small. I love this cat potty. I can not use the bags though, because my cats keeps pulling the potty part out by pulling on the plastic bags. It takes up a small space in the corner. Easy maintenance and easy to put together. This is way to small for an average cat. Maybe could be used for kitten. Definitely a waste of money. Was not what I was expecting. Returned it with no hassle and they gave me full credit. Love dealing with overstock. "I can't find the video." "how do you get the cat to know to use this to go to the bathroom?" Cats usually figure it out. However, if you are switching cat boxes, there are generally two schools of thought. Set the new box up next to your current cat box for about a week and then take the old one away. My cat didn't like that idea, so I took out the old one but saved some of the cat litter and incorporated it into the new. They are all about smells. That worked great.